Politics on THE ENVIRONMENTALIST: Who are the Kurds? A friend who'd heard that I'd spent time with the Kurds once asked me, 'who are they?' That query led to this post. With President Obama's focus on Turkey, the withdrawal of our troops from Iraq and the threat of increased instability in the region, the question has again become pertinent. Who are the Kurds? Who are these Middle Eastern people that have both men and women in their army? These mountain warriors that many refer to as the best fighters in the Middle East; these ancient people whom claim descent from the Biblical Medes and count among their number: Saladin, the Muslim leader who defeated Richard the Lionheart and, more recently (through her mother), the late Benazir Bhutto. Kurds were once a mostly nomadic people living around the mountainous regions of Iraq, Iran, Turkey and Syria. Mostly Sunni (there are Kurdish Shi'a, Alevi, Yazidi, Jews, Zoroastrians, Christians, etc), they are known to hold their Islam with a light touch. Promised an autonomous Kurdistan under the terms of the 1920 Treaty of Sevres, they saw it rescinded under the 1923 Treaty of Lausanne. The Patriotic Union of Kurdistan says they are working for "self-determination, human rights, democracy and peace for the Kurdish people of Iraq. The Secretary General is Jalal Talabani, the current president of Iraq." The PUK has extensive business interests in the region (a visitor once reported every gas station between the Turkish border and Irbil has belonging to either the PUK or KDP) and relationships with western powers, cultivated, in part, by Talabani's youngest son, Qubad, the U.S. Representative of the Kurdish Regional Government. The Kurdish Democratic Party of Iraq was founded by Mustafa Barzani, the legendary Kurd who fought numerous revolts against Baghdad with success. It was established in Iranian Kurdistan in 1946. Rebelling against the Iraqi government in the aftermath of the first Gulf War, the KDP became perhaps the single most influential Iraqi anti-Saddam group. Its Peshmerga, or militia fighters, were able to operate with relative impunity in the no-fly zone of northern Iraq. The KDP is the leading party in the Kurdistan Regional Government (Iraqi Kurdistan). Their leader, Mesud Barzani, is the President of Iraqi Kurdistan (the Kurdistan Regional Government). His son is the Prime Minister, with other clan members in similar positions of authority and the main body of the Peshmerga forces (the Kurdish Militia) reporting to them. 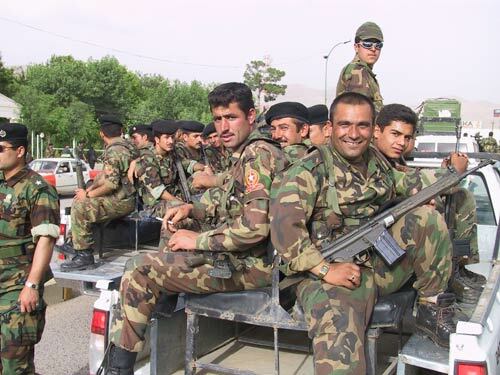 The Iranian Kurdish Militia probably numbers less than 1,000 in Qandil and thousands more underground in Iran. It recruits female guerrillas and boasts that its cruelest and fiercest fighters are Iranian women drawn to the movement's radical feminism. Falling under the leadership of the KDP and the PUK, the Peshmerga, a Kurdish compound word that means "Those who face death," is rumored to be between 100,000-190,000 strong (they may be much larger) and are considered one of the most effective fighting forces in the Middle East. Since 1984 the separatist PKK waged a violent terrorist insurgency in southeast Turkey, directed against both security forces and civilians, almost all of them Kurds, whom the PKK accuses of cooperating with the State. The government of Turkey in turn waged an intense campaign to suppress PKK terrorism, targeting active PKK units as well as persons they believe support or sympathize with the PKK. In the process, both government forces and PKK terrorists committed human rights abuses against each other and noncombatants. According to the Government, from 1984 through November 1997, 26,532 PKK members, 5,185 security force members, and 5,209 civilians lost their lives in the fighting. Turkish Kurds point to the low standard of living in Southeastern Turkey, the oppressive measures the Turkish Kurds have endured, restrictions on their language, freedoms, opportunities (the remediation of some of which are conditions for Turkish EU membership). The Turks point to the PKK bombings of their tourist sites and the subsequent loss of lives. What they do not talk about is the internal pressure upon the Turkish government by their own secular right-wing nationalist movement that has been growing in juxtoposition to the Islamic influence of their new president, Abdullah Gul. and his ruling party. As many of these nationalists are also anti-Kurd, it puts the Kurds (who, as mentioned above, are mostly Sunni, but who are also known to hold their Islam with a light touch) the focus of an argument that is not entirely of their making. It was into this miasma of nationalism, religion, militancy, terrorism, education and aspiration that the destabilizing influence of the Iraq war was introduced. While the two democratically aligned Kurdish clans did benefit from the removal of Saddam Hussein, the PKK, which has put bases over the Iraqi border, has become increasingly isolated on the world stage. This means the Iraqi Kurdish Regional Government must balance their citizenry's concerns about the Turkish incursion with their need to get along with the Western world. Why does the West care? The Iraq Kurds have oil, as referenced in this earlier post, Kurdistan Hunts for Oil, regarding the deal between the KRG and Texas' Hunt Oil. This gives the KRG a bargaining position with the oil hungry West and East, along with the impetus to maintain a peaceful relationship with both sides. The PKK traditionally come out of the mountains to fight (old saying: Kurds have no friends but the mountains...) when the snow melts. Therefore, it is possible the Turks will undertake engagement to limit the PKK's capability for a spring offensive. All of which would come to naught if war were to break out between the Iraqi Kurdish militia (Peshmerga) and Turkey over the PKK, though precedent would seem to point to the opposite, as when the Iraqi Peshmerga previously worked with Turkey to drive the PKK out of their territory. (When a friend visiting a Peshmerga camp during that period found the Pêşmerge cleaning their weapons in anticipation of a battle with the PKK, the Peshmerga commander explained, "ez ĥes ji partî demokratî dikim [I like the Democratic Party]." Conflict that could escalate if the Turks were to kill Kurdish civilians or any Peshmerga soldier. Then the equation would change as two of the U.S.'s closest allies (Turks and Iraqi Kurds) look to their western ally for support, while Russia, Iran and other interested parties back whichever side is not chosen. The start of a new cold and/or hot war with no good outcome. There is pressure from within, as well: the Kurdish desire for independence self-suppressed by the aforementioned pragmatism could escalate through conflict with Turkey -- a move that would be sure to draw the large Kurdish minorities (Turkey, Iran, Iraq, Syria, Russia...) into the fray. This is what Bill Clinton might have been trying to say, when he said that troops may be necessary in Northern Iraq and what Barack Obama may mean (just guessing here), when he says we must be as "careful getting out [of Iraq] as we were careless getting in." There is also the problem of Kirkuk, the oil rich city in Northern Iraq that the Kurds see as their Jerusalem and the rest of the Iraqis and the Turks see as the oil prize of the region. Kirkuk may be the actual tipping point between the interested parties that could lead to further destabilization. A personal anecdote about an evening I spent with a Kurdish family as part of research for a book: I was interviewing a local Kurd when he announced to his wife that I was joining his family for dinner (ten minutes before dinner). The serving spoon that landed on his head led him to follow her around the rest of the night asking what he'd done wrong (he never did figure it out). The food was among the best I've tasted -- Kurdish cooking is amazing -- the hospitality warm and inclusive in a night that devolved into the extended family taking out musical instruments (an important part of Kurdish culture) and all of us getting drunk on pot-stilled whiskey from which I will likely never recover. I fell in love with the Kurds that night and, while I don't know what will happen out of the mess we've made of the Middle East, I do know the Kurds are a key to either war or peace.